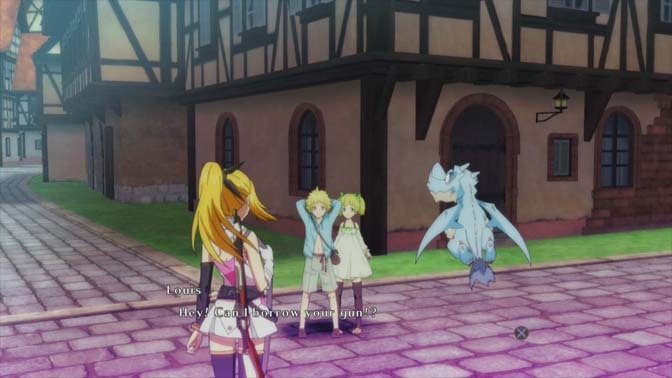 Time and Eternity is an RPG where you play as a young woman who has two souls living inside of her, Toki (red hair) and Towa (blonde hair). After nearly being assassinated on her wedding day, she travels back in time to find out who almost killed her fiance and stop them from ruining her wedding (and life). A lot of this game is animated, and I don't mean in the usual sense. I mean all of the characters and monsters are animated like an anime (Japanese cartoon) show. It looks amazing, and is smooth most of the time. There are several scenes where the characters have lots of movement, and the look really reminds me of those point and click/choose your own adventure games from the 90s that have animated characters (think Disc World or Willy Beamish). 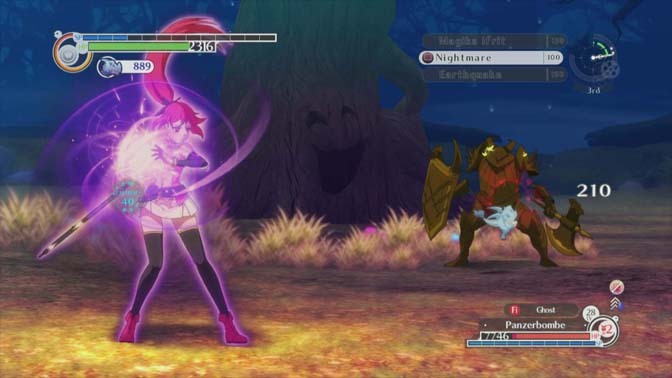 The enemies and all of their attacks and the attacks of your characters are fully animated as well, with Toki/ Towa's spell casting animation being a personal favorite. 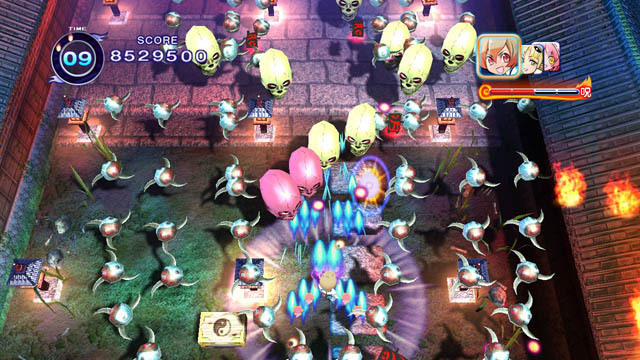 Visually, the game is very eye-catching. My wife remarked when seeing it for the first time, "Wow, it really does look like you are playing an anime." Of course, the awesome visuals are not without downsides. There are many palette swaps in the game, from the townspeople you talk to to the enemies you fight. While playing, you will see many similar people giving you quests as well as dispatching lots of recolored and resized golems, birds and zombies. However, there is a good variety of enemies, even if their are many of each type. Besides the aforementioned golems, birds and zombies, there are vampires, succubi, ninjas, robots and even flying eye...things. The other problem with the visuals is sometimes the animation appears choppy. I was playing the downloaded version, so I'm not sure if it was the game or maybe the hard drive. The game is dubbed and many of the lines are voiced. The voices for the characters are fitting for the most part, and everything sounds fine. I didn't see any option to switch to Japanese audio for those of you that prefer that. The music is pretty good, but not the most memorable. One of the dungeon tracks keeps reminding me of Chrono Trigger music, though. Run up to my face, meet my knife. Moving around the towns and world map is done by selecting your destination from a point on the map. You can shop, pick up quests and go home to save your game. Some of these areas do have a 3D model that you can walk around in, but that only occurs during a few quests. However, it is actually nice to just pick the place on the map, since it cuts out a lot of walking (which you will be doing lots of in the dungeons). I wish you could save on the town or world map, but you can only save in your house or at a save point in a dungeon. 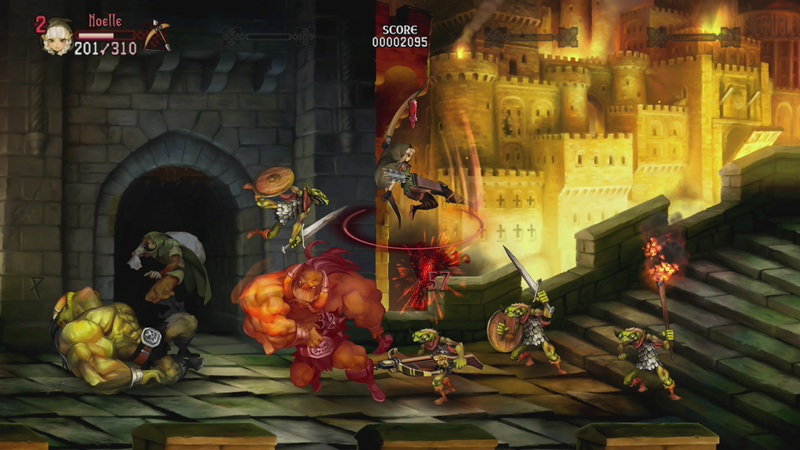 The dungeon environments in are 3D areas that allow you to run around freely. They look pretty nice, but of course not as nice as the animated characters and monsters. Many locations are distinct from each other, from island to haunted woods to floating ruins. Some of them are deceptively large and it will take awhile to run through them. The map for each area is very good, since it marks all of the important points when you enter, so you don't need to run around finding all of the waypoints and treasure chests, since you can see where they all are whenever you check the map. Very nice and very handy. The only complaint I have with the areas are some of the waypoints are too far apart from each other, and are not really close to something you would need (a warp point, save point or quest giver/objective). Fights in Time and Eternity have lots of action, and are all one on one fights. You can fight multiple enemies, but it's just a series of linked one on one fights. The circle button is your default attack, which is a rifle at distance and a knife when up close. You can buy "gifts" which will give you different skills when you level up, both passive and active. Active skills are activated with the other buttons (X, Square and Triangle) and require SP. Most skills and spells are really useful, from powerful spells and healing to skills that break the opponent's guard or knock them back. 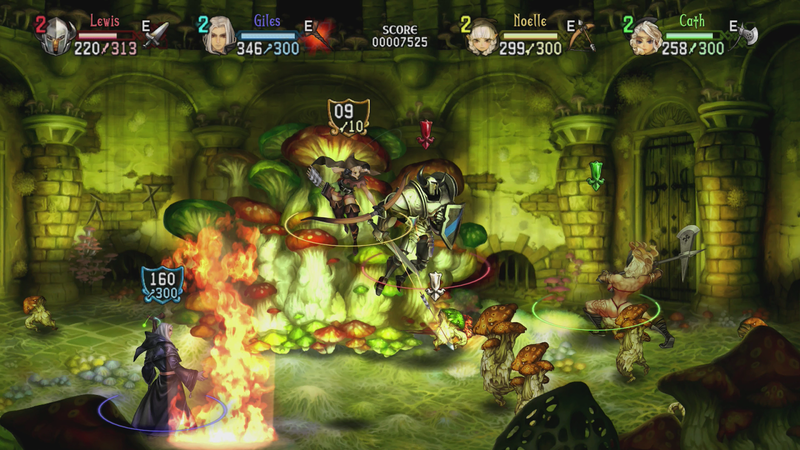 Spells take some cast time, and both spells and skills can be interrupted by some attacks. Learning when to dodge, block and attack will make fights much easier. If you don't learn the different opponents, expect to chug lots of healing items. All of the pattern recognition and learning when to dodge and attack was reminiscent of Punch-Out! to me. It wasn't too hard to make my way through most of the game. As long as you pay attention to the patterns of enemies, you can get through without much damage, and when you are low Drake can heal you. If you do lose a fight, you can retry it, so there isn't really a penalty for losing. However, there are a few really aggressive enemies, and they are really annoying. Most enemies have gaps in their patterns for you to counter attack. The few aggressive enemies just keep hitting, requiring you to just take damage while dealing your own (the vampires are the biggest offenders of this). Since they are constantly assaulting you, magic and skills are rarely an option for those particular foes. Knocking them back only buys you a few seconds, since they will just run back to you and continue the onslaught. The best option is to use skills that dizzy them, but it can take several levels before you have access to them. Spells are useful and I love the animation on them. A powerful ability that Toki and Towa get is time manipulation. Yes, this is part of the story, but at certain points you get abilities that can be used in battle. The first spell reverses part of the current turn, and can be used as a "do over" button. This wasn't very useful to me. The next time spell speeds you up incredibly. The enemy still moves at normal speed, but you are super speedy, attacking and casting spells with enough speed that it's hard to be interrupted. Personally, I'd rather it slow the enemy, but it is very useful and very powerful. 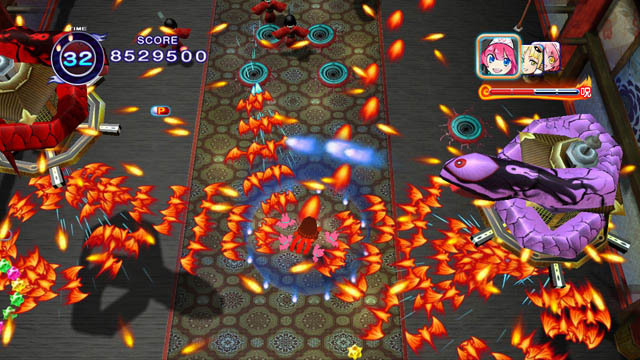 You can bombard a tough enemy very quickly, making hard fights much easier. The third ability is Time Hold, which will stop an enemy from moving for a brief time. It's moderately useful, and would be more so if it lasted longer. The only drawback is you have a limited number of times to use these spells, and that limit can only be recharged by using an item, going home or leveling up. Sometimes the combat feels unresponsive though. After dodging an attack, it seemed to take longer to actually counter-attack than it should. Hitting the button repeatedly would work, but it was very easy to then attack too many times and get hit. It never got me killed, but sometimes I would get hit with a big attack, or get knocked down and lose all of my SP. The game is very quest heavy. The main story is basically a long series of quests, and there are numerous side quests to complete, many of which are not required. Since I'm a completionist, I would get every quest I could and complete them all. They reward you with money and Gift Points, which is another good reason to complete as many as you can. All of the quests are either talk to a certain person, go get an item, or kill some monster. They aren't too original, but many of near each other, so you can work on several at a time. About halfway through the third chapter, the enemies' levels were suddenly about five higher than mine. This stuck me as odd, since I don't run from fights and had done every sidequest up to that point. I probably wouldn't have noticed, but I stared taking more damage that I thought I should and then noticed the level difference. I had to resort to a little grinding to catch up. Yeah, sure 10 year old kid, just borrow my gun. I don't really feel it needed to have grinding in it. As mentioned before, I did every sidequest, and I had about 23 hours of playtime at that point. You could ignore most of the sidequests, but you would have to be insanely good at combat or use lots of healing items to try and blast through the game. One playthrough would run about 30 hours, and there are three different endings and a new game plus (yay!) to give you more things to do if you so choose. There's a decent mix of trophies in Time and Eternity. You get some for finishing every subquest in each chapter, getting the endings, having lots of money, getting combos and chemistry. The longest ones are likely getting all of the 'gifts', which are the skill sets you unlock with Gift Points and the trophy for maxing out your level. Most of them aren't very hard (just require some more grinding), but some, like getting all the meals from the two girls, can be missed. All in all, I had fun playing Time and Eternity. The animation looks great, and is the game's best selling point, even if sometimes choppy and marred by many palette swaps. The fights were fast paced, one on one fights, and I had lots of fun destroying enemies with spells and unloading the rifle on them. The Groundhog Day-like story was pretty interesting, too. There were some silly parts, like threatening to report one bad guy to the BBB (yes, that's really in there, and I found it funny), but I liked the core story of stopping the assaults on the wedding enough to push me forward. It's a pretty fun JRPG, but I don't think it would turn a casual RPG player into a diehard. The look of the game would sure get their attention though. If you want to see the game in action, I made a video on Youtube showing the combat and a small story scene. 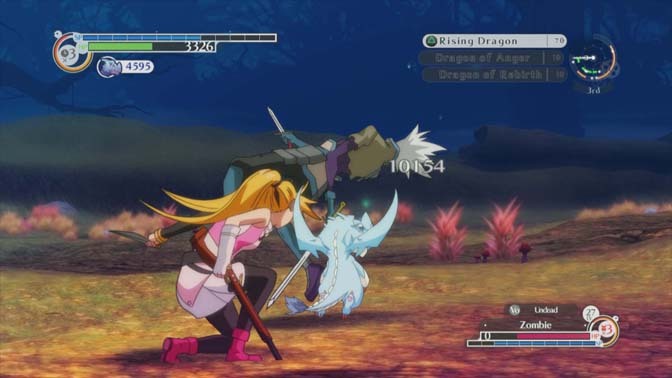 The game won't be for everyone, but go ahead and see if the combat looks interesting enough to try it out.